Last month the Social Work Department at the Ptolemy Reid Rehabilitation Center (PRRC) observed International Day of Persons with Disabilities by hosting a Foot Care Workshop for the diabetic patients of its Amputee Clinic. A large amount of the clinic’s amputee patients include adults aged 35 to 75 who suffer from diabetes. Activities included a presentation on proper diet for diabetics, a discussion on diabetes and foot care, and demonstrations on proper diabetic foot care techniques for patients. 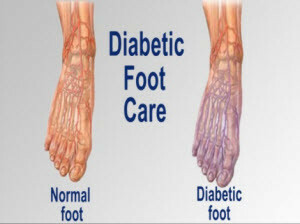 Diabetics must pay special attention to their feet to help prevent any complications. If you have diabetic foot care concerns, consult with one of our podiatrists from Foot HealthCare Associates. Our doctors will provide quality care for your diabetic feet. Read more about how diabetics should care for their feet.